Panda at National Zoo in Washington, D.C. The panda or giant panda (Ailuropoda melanoleuca) is a mammal native to central-western and southwestern China and Tibet, characterized by woolly fur with large, distinctive black patches (or dark brown in one subspecies) around the eyes, over the ears, and across its round body. It is classified as a carnivore (order Carnivora) in the bear family, Ursidae. Though belonging to the order Carnivora, the panda has a diet which is 99 percent bamboo. Pandas may eat other foods such as honey, eggs, fish, and yams. The term panda is also used for the red panda, Ailurus fulgens, another mostly herbivorous mammal, specialized as a bamboo feeder, but only distantly related to the giant panda. Also known as the lesser panda, the red panda is slightly larger than a domestic cat (55 centimeters long), with semi-retractable claws, and like the giant panda has a "false thumb," which is really an extension of the wrist bone. It has reddish fur, white face markings, and a bushy tail with six alternating yellowish-red transverse ocher rings. The red panda is native to the Himalayas in Nepal and southern China. Panda is also a genus of the plant family Pandaceae. The word panda is derived from the Nepalese word ponya, which means bamboo and plant-eating animals in Nepal. The giant panda is an endangered animal; an estimated 2,000 to 3,000 pandas live in the wild (BBC 2006a), with 50 in captivity outside China and at least 350 reported to live in captivity in mainland China (McShea 2015). The giant panda has had a unique role in recent years, having formed an important part of the diplomacy of the People's Republic of China (PRC) toward the West—cultural exchanges termed "panda diplomacy." Since 1984, however, China has offered pandas to other nations not as gifts but rather for substantial payments, and with the provision that any cubs born during the loan period are the property of the People's Republic of China. The giant panda is a favorite of the human public, at least partly because many people find that the species has an appealing "baby-like" cuteness. Also, it is usually depicted reclining peacefully eating bamboo, as opposed to hunting prey, which adds to its image of innocence. However, in reflecting on the adage, "don't judge a book by its cover," though the giant panda is often assumed docile because of their cuteness, they have been known to attack humans. This is usually assumed to be out of irritation rather than predatory behavior. Research shows that in cases in which its offspring may be under threat, the panda can and most often will react violently. The giant panda has a black-and-white coat. Adults measure around 1.5 meters long and around 75 centimeters tall at the shoulder. Males can weigh up to 115 kilograms (253 pounds). Females are generally smaller than males, and can occasionally weigh up to 100 kilograms (220 pounds). Giant pandas live in mountainous regions, such as Sichuan, Gansu, Shaanxi, and Tibet. 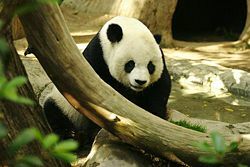 While the Chinese dragon has been historically a national emblem for China, since the latter half of the twentieth century, the giant panda has also become a national emblem for China. Its image appears on a large number of modern Chinese commemorative silver, gold, and platinum coins. The giant panda has a paw, with a "thumb" and five fingers; the "thumb" is actually a modified sesamoid bone, which helps the panda to hold bamboo while eating. The radial sesamoid, underlying a pad on the panda's forepaw, is elongated and greatly expanded until it approximates the size of the true digits, which form the framework of another pad (Gould 1980). Gould (1980) in his book, The Panda's Thumb, uses the development of this "thumb" as evidence for evolution, since it is not a completely new or "ideal design," but rather an odd arrangement that results from a natural process constrained by history. It offers support for the view, also accepted in some deistic views of creation, that more recent forms come on the foundation of earlier forms. The giant panda also has a short tail, approximately 15 centimeters long. Giant pandas can usually live to be 20 to 30 years old while living in captivity. The giant panda is considered to be a living fossil since it has same maintained the same form for millions of years (Maynard 2007). Until recently, scientists thought giant pandas spent most of their lives alone, with males and females meeting only during the breeding season. Recent studies paint a different picture, in which small groups of pandas share a large territory and sometimes meet outside the breeding season. Like most subtropical mammals, but unlike most bears, the giant panda does not hibernate. Pandas eating bamboo at the National Zoo in Washington, D.C. Despite its taxonomic classification as a carnivore, the panda has a diet that is primarily herbivorous; it consists almost exclusively of bamboo. However, pandas still have the digestive system of a carnivore and do not have the ability to digest cellulose efficiently, and thus derive little energy and little protein from consumption of bamboo. The average giant panda eats as much as 20 to 30 pounds of bamboo shoots a day. Because pandas consume a diet low in nutrition, it is important that they keep their digestive tract full. Bamboo leaves contain the highest protein levels; stems have less. The timber profit gained from harvesting bamboo has destroyed a significant portion of the food supply for the wild panda. The panda also has pushed its habitat to a higher altitude and limited available space. Twenty-five species of bamboo are eaten by pandas in the wild, but it is hard to live in the remains of a forest and feed on dying plants in a rugged landscape. Only a few bamboo species are widespread at the high altitudes pandas now inhabit. 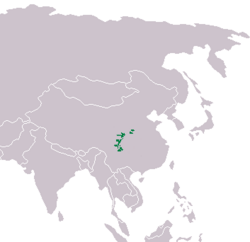 Because of such elements, the population of wild pandas decreased by 50 percent from 1973–1984 in six areas of Asia, all of them in China. Because of the synchronous flowering, death, and regeneration of all bamboo within a species, pandas must have at least two different species available in their range to avoid starvation. The panda's round face is an adaptation to its bamboo diet. Their powerful jaw muscles attach from the top of the head to the jaw. Large molars crush and grind fibrous plant material. While primarily herbivorous, the panda still retains decidedly ursine teeth, and will eat meat, fish, and eggs when available. In captivity, zoos typically maintain the pandas' bamboo diet, though some will provide specially formulated biscuits or other dietary supplements. Contrary to popular belief, giant pandas do not reproduce slowly. Studies have shown no evidence that giant pandas have any problems breeding in their natural habitat (McShea 2015). A female panda may have 2–3 cubs in a lifetime, on average. Growth is slow and pandas may not reach sexual maturity until they are five to seven years old. The mating season usually takes place from mid-March to mid-May. During this time, two to five males can compete for one female; the male with the highest rank gets the female. When mating, the female is in a crouching, head-down position as the male mounts from behind. Copulation time is short, ranging from thirty seconds to five minutes, but the male may mount repeatedly to ensure successful fertilization. The whole gestation period ranges from 83 to 163 days, with 135 days being the average. Baby pandas weigh only 90 to 130 grams (3.2 to 4.6 ounces), which is about 1/900th of the mother’s weight. Usually, the female panda gives birth to one or two panda cubs. Since baby pandas are born very small and helpless, they need the mother’s undivided attention, so she is able to care for only one of her cubs. She usually abandons one of her cubs, and it dies soon after birth. At this time, scientists do not know how the female chooses which cub to raise, and this is a topic of ongoing research. The father has no part in helping with raising the cub. When the cub is first born, it is pink, furless, and blind. It nurses from its mother's breast 6–14 times a day for up to 30 minutes each time. For three to four hours, the mother might leave the den to feed, which leaves the panda cub defenseless. One to two weeks after birth, the cub's skin turns gray where its hair will eventually become black. A slight pink color may appear on the panda's fur, as a result of a chemical reaction between the fur and its mother's saliva. A month after birth, the color pattern of the cub’s fur is fully developed. A cub's fur is very soft and coarsens with age. The cub begins to crawl at 75 to 90 days and the mothers play with their cubs by rolling and wrestling with them. The cubs are able to eat small quantities of bamboo after six months, though mother's milk remains the primary food source for most of the first year. Giant panda cubs weigh 45 kg (99.2 pounds) at one year and live with their mother until they are 18 months to two years old. The interval between births in the wild is generally two years. The red panda and the giant panda, although completely different in appearance, share several features. They both live in the same habitat, they both live on a similar bamboo diet, and they both share a unique, enlarged bone called the pseudo thumb, which allows them to grip the bamboo shoots they eat. Hua Mei, the baby panda born at the San Diego Zoo in 1999. Two subspecies of giant panda have been recognized on the basis of distinct cranial measurements, color patterns, and population genetics (Wan et al. 2005). Ailuropoda melanoleuca melanoleuca consists of most extant (living) populations of panda. These animals are principally found in Sichuan and display the typical stark black and white contrasting colors. Qinling Panda, Ailuropoda melanoleuca qinlingensis is restricted to the Qinling Mountains in Shaanxi at elevations of 1300–3000 meters. The typical black and white pattern of Sichuan pandas is replaced with a dark brown versus light brown pattern. The skull of A. m. qinlingensis is smaller than its relatives and it has larger molars. The name "panda" originates with a Himalayan language, possibly Nepali. And as used in the West, it was originally applied to the red panda, to which the giant panda was thought to be related. Until its relation to the red panda was discovered in 1901, the giant panda was known as mottled bear (Ailuropus melanoleucus) or particolored bear. 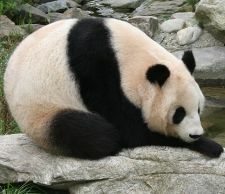 The Chinese language name for the giant panda, 大熊貓, literally translates to "large bear cat," or just "bear cat" (熊貓). Most bears' eyes have round pupils. The exception is the giant panda, whose pupils are vertical slits like cats' eyes. These unusual eyes, combined with its ability to effortlessly scale trees, are what inspired the Chinese to call the panda the "large bear cat." Unlike many other animals in ancient China, pandas were rarely thought to have medical uses. In the past, pandas were thought to be rare and noble creatures; the mother of Emperor Wen of Han was buried with a panda skull in her tomb. Emperor Taizong of Tang was said to have given Japan two pandas and a sheet of panda skin as a sign of goodwill. The giant panda was first made known to the West in 1869 by the French missionary Armand David, who received a skin from a hunter on March 11, 1869. The first Westerner known to have seen a living giant panda is the German zoologist Hugo Weigold, who purchased a cub in 1916. Kermit and Theodore Roosevelt, Jr., became the first foreigners to shoot a panda, on an expedition funded by the Field Museum of Natural History in the 1920s. In 1936, Ruth Harkness became the first Westerner to bring back a live giant panda, a cub named Su-Lin (Wadson 2003), who went to live at the Brookfield Zoo in Chicago. These activities were halted in 1937 because of wars; and for the next half of the century, the West knew little of pandas. Loans of giant pandas to American and Japanese zoos formed an important part of the diplomacy of the People's Republic of China (PRC) in the 1970s as it marked some of the first cultural exchanges between the PRC and the West. This practice has been termed "Panda Diplomacy." By the year 1984, however, pandas were no longer used as agents of diplomacy. Instead, China began to offer pandas to other nations only on 10-year loans. The standard loan terms include a fee of up to US$1,000,000 per year and a provision that any cubs born during the loan are the property of the People's Republic of China. Since 1998, due to a World Wildlife Fund (WWF, now known as World Wide Fund for Nature) lawsuit, the U.S. Fish and Wildlife Service only allows a U.S. zoo to import a panda if the zoo can ensure that China will channel more than half of its loan fee into conservation efforts for wild pandas and their habitat. 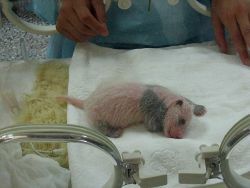 In May 2005, the People's Republic of China offered Taiwan (Republic of China) two pandas as a gift (BBC 2005). This proposed gift was met by polarized opinions from Taiwan due to complications stemming from cross-strait relations. So far Taiwan has not accepted the offer. Giant pandas are an endangered species, threatened by continued habitat loss and by a very low birthrate, both in the wild and in captivity. Various reports puts the number of pandas currently as either less than 2,000 pandas in the wild or perhaps as many as 3,000 individuals (BBC 2006a; Zhu 2006). In 2006, scientists reported that the number of pandas living in the wild may have been underestimated at about 1,000. Previous population surveys had used conventional methods to estimate the size of the wild panda population, but using a new hi-tech method that analyzes DNA from panda droppings, scientists believed that the wild panda population may be as large as 3,000 (Zhu 2006). There are also approximately 200 living in captivity in mainland China (Zhu 2006), as well as some living in zoos outside of the country. Pandas have been a target for poaching by locals since ancient times and by foreigners since they were introduced to the West. Starting in the 1930s, foreigners were unable to poach pandas in China because of the Second Sino-Japanese War and the Chinese Civil War, but pandas remained a source of soft furs for the locals. The population boom of people in China after 1949 created stress on the pandas' habitat, and the subsequent famines led to the increased hunting of wildlife, including pandas. During the Cultural Revolution, all studies and conservation activities on the pandas were stopped. After the Chinese economic reform, demands for panda skin from Hong Kong and Japan led to illegal poaching for the black market, acts generally ignored by the local officials at the time. Closeup of a baby 7-month old panda cub in the Wolong Nature Reserve in Sichuan, China. Though the Wolong National Nature Reserve was set up by the PRC government in 1958 to save the declining pandas, few advances in the conservation of pandas were made, due to inexperience and insufficient knowledge in ecology. Many believed that the best way to save the pandas was to cage them, and as a result, the pandas were caged for any sign of decline, and they suffered from terrible conditions. Because of pollution and destruction of their natural habitat, along with segregation due to caging, reproduction of wild pandas was severely limited. In the 1990s, however, several laws (including gun controls and moving residents out of the reserves) helped the chances of survival for pandas. With the ensued efforts and improved conservation methods, wild pandas have started to increase in numbers in some areas, even though they still are classified as a rare species. Recently, the numbers of pandas have been increasing. Although the species is still endangered, it is thought that the conservation efforts are working. As of 2006, there were 40 panda reserves in China, compared to just 13 reserves two decades ago (BBC 2006a). Keeping pandas in zoos is very expensive, more than five times the cost of the next most expensive animal, an elephant (Goodman 2006). As noted above (panda diplomacy), American zoos must pay the Chinese government $1 million a year in fees, part of what is typically a ten-year contract. Cubs born during the loan remain the property of China. Among zoos which have or have had giant pandas are the following. Hua Mei, born 1999 in the San Diego Zoo. Mei Sheng, born 2003 in the San Diego Zoo. Tai Shan, born July 9, 2005 at the National Zoo in Washington. 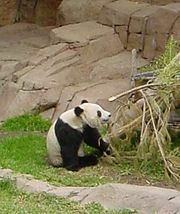 Su Lin, born August 2, 2005 at the San Diego Zoo. Mei Lan, born September 6, 2006 at Zoo Atlanta. Zoologischer Garten Berlin, Berlin, Germany: home of Bao Bao, age 27, the oldest male panda living in captivity; he has been in Berlin for 25 years and has never reproduced. Tiergarten Schönbrunn, Vienna, Austria: home to three pandas (a male and a female) born in Wolong, China in 2000, and their cub born on August 23, 2007 (Oleksyn 2007). The cub was the first to be born in Europe in 25 years. Chengdu Research base of giant panda breeding, Chengdu, Sichuan, China: home to a number of captive giant pandas. Wolong Giant Panda Protection and Research Center, Sichuan, China: 17 cubs were born here in 2006. Chiang Mai Zoo, Chiang Mai, Thailand: home to Chuang Chuang (M) and Lin Hui (F). Ocean Park, Hong Kong: home to Jia Jia (F) and An An (M) since 1999. Two further pandas named Le Le and Ying Ying were added to Ocean Park on April 26, 2007 (Yeung 2018). Ueno Zoo, Tokyo: home of Ling Ling (M), he is the only panda with "Japanese citizenship." Adventure World, Shirahama, Wakayama: home of Ei Mei (M), Mei Mei (F), Rau Hin (F), Ryu Hin and Syu Hin (male twins), and Kou Hin (M). Yu Hin (M) went to China in 2004. In December 2006, twin cubs were born to Ei Mei and Mei Mei. British Broadcasting Corporation (BBC). 2005. Trial marriages for Taiwan pandas. BBC News, October 13, 2005. Retrieved January 15, 2019. British Broadcasting Corporation (BBC). 2006a. Hope for future of giant panda. BBC News, June 20, 2006. Retrieved January 15, 2019. British Broadcasting Corporation (BBC). 2006b. Pandas gain world heritage status. BBC News, July 12, 2006. Retrieved January 15, 2019. Catton, Chris. 1990. Pandas. New York: Facts on File Publications. ISBN 081602331X. Friends of the National Zoo. 2006. Panda Cam: A Nation Watches Tai Shan the Panda Cub Grow. New York: Simon and Schuster. ISBN 0743299884. Goodman, B. 2006. Eats Shoots, Leaves and Much of Zoos' Budgets. New York Times, February 12, 2006. Retrieved January 15, 2019. Gould, S. J. 1980. The Panda's Thumb. New York: W. W. Norton. ISBN 0393300234. Lumpkin, S., and J. Seidensticker. 2007. Giant Pandas. London: Collins. ISBN 0061205788. Maynard, S. 2007. Panda granny. Australian Broadcasting Corporation, June 12, 2007. Retrieved January 15, 2019. McShea, B. 2015. Five myths about pandas. The Washington Post. Retrieved January 15, 2019. Oleksyn, V. 2007. Panda gives surprise birth in Austria. Associated Press via USA Today, August 23, 2007. Retrieved January 15, 2019. Ryder, J. 2001. Little Panda: The World Welcomes Hua Mei at the San Diego Zoo. New York: Simon & Schuster. ISBN 068986616X. Schaller, G. B. 1993. The Last Panda. Chicago: University of Chicago Press. ISBN 0226736288. Wan, Q.-H., H. Wu, and S.-G. Fang (2005). A New Subspecies of Giant Panda (Ailuropoda melanoleuca) from Shaanxi, China. Journal of Mammalogy 86: 397–402. Yeung, R. 2018. After eight years of waiting, will Hong Kong’s Ocean Park see its first locally conceived panda cub?. South China Morning Post. Retrieved January 15, 2019. All links retrieved January 11, 2019. Giant Panda Information from Animal Diversity. This page was last modified on 28 January 2019, at 16:04.